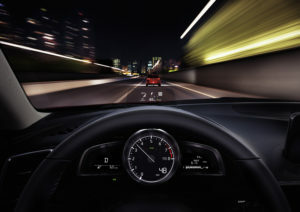 Mazda justifies its ongoing use of the “Zoom Zoom” marketing tagline by putting the driving dynamics of a high-end sports sedan in an economical package. It was fun to remind myself of this during my time with a 2018 Mazda3 GT with a 6-speed manual. Kodo Soul of Motion has been Mazda’s design language for about five years. It has aged well, as shown on this Eternal Blue Mica Mazda3. Subtle lines and curves swoop along the sides from the LED headlights to the trunk lid. There’s motion in the body even when the car stands still. Mazda clearly prides itself on offering fit and finish that would not be out of place in more upmarket vehicles. The $2,900 premium package turned the cockpit into a tactile delight. My tester offered cream-coloured leather heated seats with matching leather accents on the doors, plus leather on the shift knob and heated steering wheel. The light colour contrasts attractively with the darkness of the rest of the interior. Leather also covers the steering wheel and shift knob. Front seat headroom was fine, even though the 3 I drove sported a power moonroof. What I wasn’t expecting was adequate headroom in the rear seats. I wouldn’t want to stay there for a long trip. But I do fit without having to tilt my head or hug my knees to my chest. No issues here. 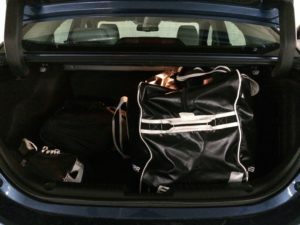 The bag fits longitudinally and the trunk closes easily. Sticks slid through the “40” portion of the 60-40 split-folding rear seats. I suspect I could fit two such bags in this trunk, albeit with a little persuasion. Mazda is sticking with a successful infotainment system input design that’s as old as its Kodo design language. The screen sits on top of the dash, as always. 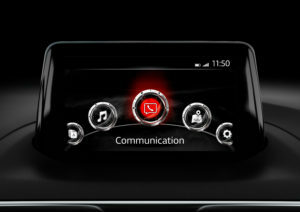 In a world that seems to embrace ever-larger in-car touchscreens, Mazda has stuck with a smallish model in the 3. You can touch the screen or you can use the HMI (Human-Machine Interface) controller. 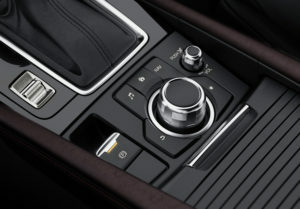 This knob/button/jooystick resides behind the shifter surrounded by five buttons and next to the on/off/volume dial. Bonus: Mazda designed the seat, armrest and control assembly so that using these controls is perfectly relaxing. I wish that were the case in all cars. Most features are easy to figure out. It isn’t the most tricked-out system on the market, but it does cover the most common bases and seems designed to be learned quickly. Audio came from a 9-speaker Bose® sound system. There’s one shortcoming: my tester did not include Apple CarPlay. Mazda was late to the CarPlay/Android Auto party, but Mazda is finally offering these phone-friendly interfaces throughout the lineup. Owners of recent Mazdas may want to contact their local dealers: the automaker is offering upgrades to older audio systems if you want Apple CarPlay or Android Auto. The instrument cluster is also a study in effective minimalism. A tachometer dominates the centre of the display. It hosts a square digital speed readout on the bottom right edge. Two small side displays flank the tach. The ensemble reminds me of an owl spreading its wings. Mazda stuck with the pop-up heads-up display (or Active Driving Display in Mazda parlance) on the 2018 Mazda3. I’ve also driven a Mazda that projects the HUD onto the windscreen. A Mazda representative tells me future models will also bid adieu to the pop-up screen. The SKYACTIV-G 2.5L 4-cylinder engine coupled with the smooth 6-speed manual make for an fun drive, whether you want to make it spirited or relaxed. Horsepower peaks at 184 while torque can reach 185 lb-ft. Mazda also offers a 2.0L engine with slightly lower performance numbers: 155 peak horsepower, 150 lb-ft peak torque. 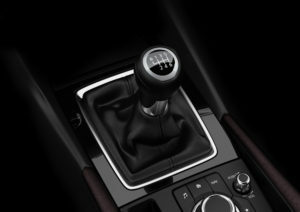 Mazda wisely foregoes the Sport drive mode switch in this manual transmission model. That makes sense. If I want to accelerate harder, I’ll delay the upshifts myself. Engine, chassis, body and transmission are engineered using Mazda’s SKYACTIV vehicle dynamics. The press materials describe it this way: “the pursuit of Jinba-Ittai, a feeling of unity between driver and vehicle.” That unity does happen. The Mazda3 constantly feels as though it’s properly anchored and will respond perfectly to anything I do. G-Vectoring Control is Mazda’s way of saying it puts more load on the front wheels when you turn the steering wheel to enhance control. It does this using engine torque to create deceleration. Drive in a straight line, and load shifts to the rear wheels. Note that this is just load – the Mazda3 is NOT an all-wheel drive vehicle. Active safety features on the GT trim include blind spot monitoring (with indicators on the HUD as well as the side view mirrors), Smart City Brake Support, and rear cross traffic alert. The Premium Package adds radar cruise control, forward obstruction warning and a lane departure warning, among other technologies. Mazda published ratings in L/100km of 8.5 city and 6.4 highway. The 3 takes regular unleaded fuel in its 50L tank. 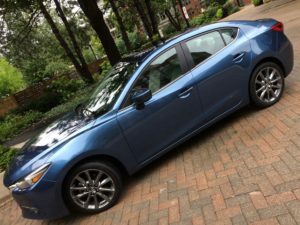 The 2018 Mazda3, as equipped, lists for $28,695 (MSRP plus options, freight and PDE).